Save $200 off any in stock vehicle when you claim the HelpAroundTown special! Mirak Auto Group's Chevrolet, Hyundai, Genesis and Hino dealerships in Arlington are here for all your sales, leasing, service, parts and body shop needs. or email us any time at Leads@mirak.motosnap.com . Come in for a test drive and you'll understand why Mirak has been going strong as a family business since 1936. For over 80 years, we've been reliable partners to families, businesses and town governments. That's how we earned the Consumer Satisfaction Award for 2016, 2017 and 2018 from Dealer Rater. 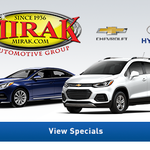 Mirak Auto Group, your local automotive experts since 1936.